I am Andrea, The Piano. 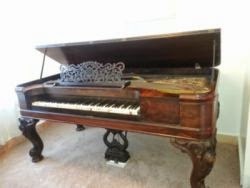 I am an 1872 Steinway Square Grand Piano. This is my blog. Here I will tell my story, the story of music, our story. and we're calling Piano Palooza. Basically, it's a fund raiser for restoration work on this old piano. Vintage Anchor Hocking from the 1960s - Prescut Glass Star of David Design. in the Beautiful City of Wyandotte, MI! Have a piano you no longer use or need? Or maybe you're someone who wants a piano. Whatever the case, do consider Piano Adoption.